Summer is the best time to catch glimpses of the galactic center of the Milky Way. 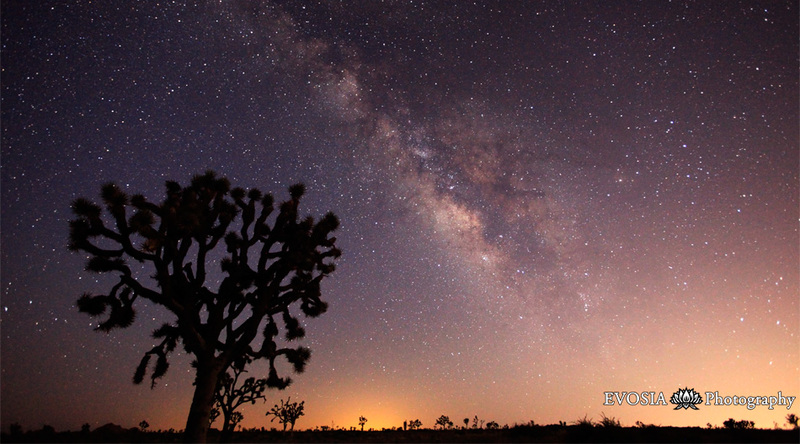 This photo was taken in Joshua Tree National Park on August 13, 2010. The galactic core of the Milky Way was visible after sunset in the South-Southeast direction but the milky way extends completely across the sky from horizon to horizon. It was visible all night long until sun rise. To see the Milky Way, the ideal time is summer during or around a new moon so that the moon light doesn’t drown it out. Head to a place far away from the pollution of city lights. To photograph the galactic core, I suggest making sure you don’t have a city positioned to the south of your location. Your long exposure will pick up the light from the city. Taken with a Canon 5D Mk II with the Canon EF 16-35mm 2.8 lens. Settings: f 2.8, 20 second exposure, 6400 iso. In the video below, you’ll notice a meteor burning up and leaving a cloud of smoke at around the 00:32 second mark. Posted on Friday, August 13th, 2010 at 9:29 am. Filed under: Films, Portfolio Tags: Joshua Tree National Park, milky way, star gazing	RSS 2.0 feed. How come there is no trail of the stars on a 20 sec exposure?? How many photos did ou take for one minute video? VERY Well done! Thank you for sharing this with the world. Hey, great job man! These are fabulous. Thanks for sharing them.